Today I'm branching out a little from my usual topics of famous artists, reasons and ways to journal, and the stories behind my own art. Why? Because I'm seeing a very serious problem, particularly in social media. I specifically waited a few days to talk about this, because I wanted to learn as much of the truth as I could, as well as see what others have to say before I throw my own little voice into the din. And now, even more than a few days ago, I feel the importance of this. I don't want to talk about depression or suicide, like, ever. I don't think anyone does. I think we can all agree that it would beyond wonderful if depression and suicide just did not exist. But they do exist, and they need to be talked about, and I'm choosing to talk about it today because I feel I have something important to say. If you were on Facebook or Twitter at all last week, you know Robin Williams' passing sparked a lot of discussion and a lot of uproar. For three days, I couldn't scroll down my Facebook news feed without seeing countless blog posts and articles on Robin Williams, depression, and suicide. The din has all but disappeared by now, or at least it has on my Facebook news feed. Maybe yours has not. And because the din has gone down, I think now is the most important time to talk about this. Depression is a really important topic to me because I have dealt with it some myself. I have friends and family members who have dealt with it. I have learned about artists who have dealt with it. I have read blog posts and articles, seen paintings, and listened to music on the subject. A lot of creative people struggle with depression, bipolar disorder, or other mental illnesses, and I've read quite a few articles and blog posts on the subject, including The Dark Side of Creativity, Artists Create Art, Cope with Depression, and Creativity and Depression. I even did a research paper on the subject of depression and art therapy. I can't even begin to list the artists, writers, actors, and other creative people who currently struggle or did struggle with depression, including the late, great Robin Williams. 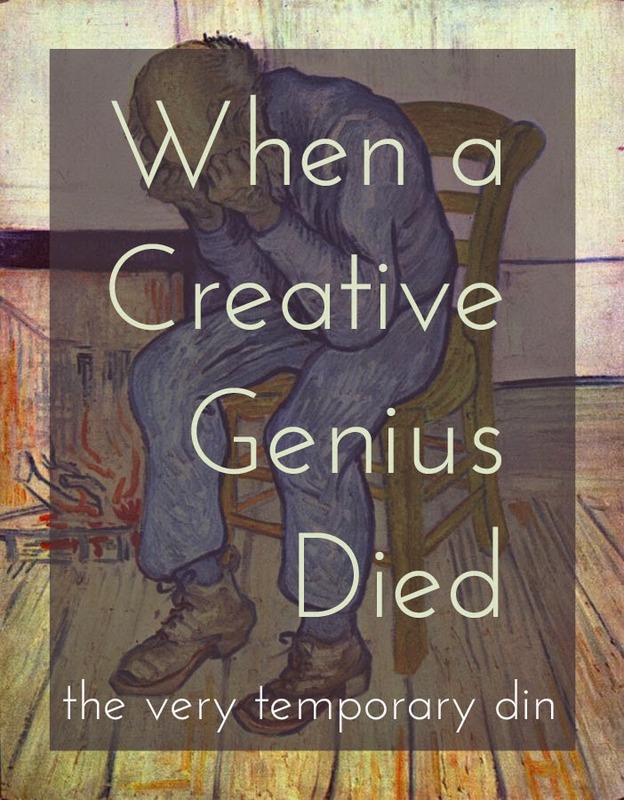 I mention this connection between creativity and depression not to romanticize it or say depression is good or useful, nor to say that I'm an expert on the subject, but because as a creative person who has experienced depression, I find it interesting. Also I mention this connection as a way to further justify writing about depression on my art blog. One of my friends posted a Facebook status one night last week that said "People are talking. People are sharing their stories. Depression is becoming less taboo. People are getting help. We will be the hopeful." I agree on one level. It's great that so many people felt compelled to share their stories, to offer encouragement and help. I loved seeing so many people (especially celebrities, with their much wider sphere of influence) sharing the phone number for the National Suicide Prevention Lifeline (which happens to be 1-800-273-TALK , and I encourage anyone who's considering suicide to call right away, they're available 24/7 and believe me, calling them is not making yourself a burden for them. If you need help, they would call you if they only had your number! But they don't, so do yourself and your loved ones a favor and call). That being said, there are two problems I have with all this recent talk about depression. Did you see what happened last Monday? The news and internet exploded with the topics of depression and suicide. But like an explosion, it was there and then it was gone. Why is this topic only discussed in the two days following the death of a beloved celebrity? To my friend with the Facebook status, I want to say this: people are not talking. They threw their voices into a very temporary din. I loved Robin Williams as much as anyone. Why, I ask, did it take such a heartbreaking, devastating act to make suicide and depression become something to talk about? Why can't we talk about this before the next death, rather than after? Depression was not new for Williams; he struggled with it his entire life. All this discussion, all these tributes to Robin Williams, all the posts with the suicide prevention phone number, why did they have to come after this tragedy? As with any loss, it's good to go back to life as usual and not dwell on our sorrow. It's healthy. I'm not saying we should spend all our time obsessing over Robin Williams' death. But neither am I saying it's alright to talk about nothing but depression and suicide prevention for three days and then move on and not give it another thought until the next celebrity suicide. Go about life as usual, but don't be unchanged. We have a responsibility to our loved ones to always be aware of the signs of depression and suicidal thoughts and be ready to support one another at all times. Depression doesn't need to be a silent fight. One of the big struggles in living with depression is feeling alone, right? Depression is a lonely struggle, and the stigma surrounding it doesn't help. No one can just remove another person's depression, nor can three days of discussion make this issue go away. So why are we not talking about this all of the time, and helping people with depression see they're not alone all of the time? My friend's post has already been proved wrong. People are not talking about this; they did talk about this. And now they've gone back to arguments over organic foods and feminism, obsessing over Disney movies, and sharing cat videos. Why, dear friends, are cat videos going viral again just one week after the internet exploded with talk about something as serious and vitally important as suicide prevention? Do you see what's wrong here? Do you see the imbalance? Let's be intentional about this. Let's make a point of asking our friends how they're really doing today. Let's try to encourage at least one person each day, even if it's just a simple text message. In fact, if you're feeling really crazy, why don't you jump over to your favorite search engine and type in "suicide prevention" and learn more about this? Or scroll to the end of this post and click on the TWLOHA link? Please, let's make this last longer than a few days, in memory of Robin Williams, if for no other reason. Now for my second point, words. I don't know about you, but I saw some hope and encouragement last week, and also a lot of angry, rude, illogical ranting. My friends, I don't care whether suicide is a selfish act or not! I don't care what little semantics you use to define depression! Those are side discussions that are, frankly, irrelevant in the face of this life-and-death issue. The reality is, depression is a very personal, individual issue, and no one blogger (or comment on a blog) has the authority or the ability to say just what helps or hurts those with depression. And friends, do you know what does not help prevent suicide? Things like The Academy's tweet "Genie, you're free". I realize that whoever came up with that idea had the best of intentions, and didn't mean to cause such an uproar or to make suicide sound like a good option, but that did nothing to help. Suicide is not the way to freedom. Nor, as some people have argued, is it something that happens to someone. It is the awful, heartbreaking decision to give up on life, and that decision comes from a very dark, hopeless, and unhealthy state of mind. Why are people so quick to throw their voices into the din without thinking about what they're saying and the consequences of those words? Why is there so much anger and thoughtlessness in the wake of a suicide? Shouldn't the internet explode with encouragement and prayer? Shouldn't this be a time when people come together to share the horrible burden Robin Williams' family must carry? Why are we arguing and criticizing one another instead of writing open letters of love and support to his family, and to everyone who is trembling under the weight of depression? Believe me, I know how easy it is to say something without realizing the impact of those words. My friends will tell you, "grace" is not my middle name. I've certainly said and written my fair share of hurtful things, intended or not, and I've felt my fair share of regret for those words. I'm not trying to make anyone feel guilty (that's the last thing anyone needs), but to point out the importance of suicide awareness and words-awareness. I'm just asking everyone who reads this to join me in trying to make a change. I know that a few days ago I invited you to join me in making an art journal, but if you only feel like helping me with one thing at a time, this is much more important than any journal project or silly Instagram hashtag. This is about reaching out and encouraging rather than bringing people down, especially in the wake of such heartbreak. So to Robin Williams' family and friends: my heart breaks for you, and my prayers are with you. I hope and pray you're able to find peace in the wake of this devastating loss. To those struggling with depression or considering suicide: Please, please, please seek help. Suicide is not the answer you're looking for. Please, call or visit Suicide Prevention Lifeline to talk with someone. You are not alone in this. To everyone on social media: please be aware of your words and the way they can impact others. Let's make a change, and let's make it last. Please. 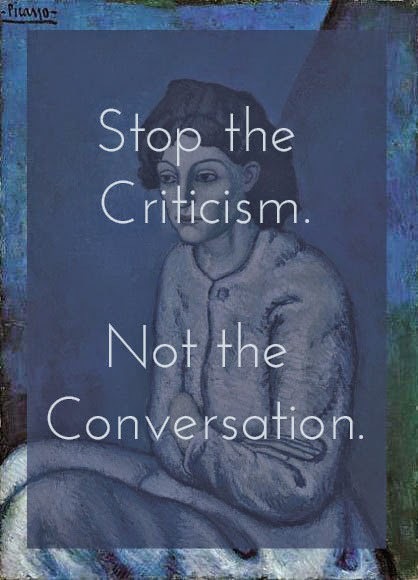 Stop the criticism, but don't stop the conversation. P.S. The last part of my friend's Facebook post, "we will be the hopeful", is a reference to a really awesome non-profit called To Write Love On Her Arms, which spreads awareness and seeks to help people struggling with depression, self-harm, and addictions. You should definitely go take a look at what TWLOHA is doing. P.P.S. I mentioned my art journal up there and I just want to say that yes, I have been faithfully writing and gluing and painting and coloring and such, despite the craziness of moving back into my college dorm and starting classes. Don't worry, pictures will be arriving here on the blog sometime later this week, so that's cool. *The group "everyone in the world who has depression, has considered suicide, or has been affected by the depression or suicide of someone else" includes everyone. Everyone in the world has been personally affected by this in some way. So yes, I just asked everyone in the world to do something, on the behalf of everyone in the world. Bam. Such a beautiful post by an even more beautiful young woman. I love you Cailey!